Jennifer Kroll, a student at Your Community Yoga Center, is a published freelance writer who worked for twenty years in children’s and educational publishing. She is the author of over twenty published books for kids, teens, and teachers. 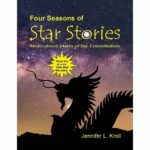 Her most recent book is Four Seasons of Star Stories:Multicultural Myths of the Constellations. The reading level is Grade 5, but the stories are appealing to all ages. Jennifer also writes poetry for adults as J.L.L. Kroll. Click on the titles to read more about her chapbook Ghost Town Girls and Pantheon: Poetry and Photographs. Visit Jennifer’s website www.giantskybooks.com to read more about Jen’s work! All of Jennifer’s books can be found on Amazon by clicking here!